On sale! (normally $25) The TP-LINK High Gain USB Adapter TL-WN822N is a 300Mbps wireless client that is fully interoperable with IEEE 802.11n/b/g wireless devices, delivering fabulous N speed and reliable signal for online gaming, video streaming or Internet calls. 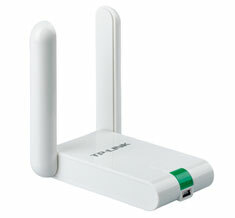 TL-WN822N features its dual external antennas which could bring a wider and further coverage. Also, TL-WN822N provides QSS (Quick Setup Security), establishing powerful and robust security at the push of a button. It comes with a 1.5m USB extension cable.